Let’s pretend we have never read this story before. Let’s pretend we don’t know the ending and see that, “Oh yay, Lazarus is back to life!” Let’s pretend that we see what is going on for the first time. When I was a child I had never seen anyone die. I have seen a few deaths now. You sit by helplessly as a person you love slips away from you. You watch them suffer as their body slows down and shuts down never to start again. Mary and Martha sent word to Jesus because their brother was slowly slipping away from them. They asked Jesus to come and he refused. Mary and Martha watched the light fading from their brother’s eyes and it cut them deeply. When they meet with Jesus and ask him questions there is a mixture of grief and confusion in the air. They know that Jesus loved their brother, but he did not come. They know that Jesus could have saved their brother, but he did not come. They know that Jesus can ask for anything from his Father, but he did not ask. Jesus has healed many. Jesus has touched people with life-giving hands. Jesus did not save his friend from dying. However, the focus of Jesus’ life is not about these friends. The focus of Jesus’ life is on his service to the Father. The Father’s plan is to allow people to die. We are so much of this earth that we don’t understand how death can be good. We don’t see how suffering can be in the plan. “To live is Christ; To die is gain” said the apostle Paul. Death has lost its sting, we are told. Yet Jesus weeps. He feels grief. In the limitations he has placed on himself, he experiences loss. He allows himself to enter into the suffering that his faithful service of God the Father has caused. Lazarus is dead. Martha weeps. Mary weeps. Mourners weep. Jesus weeps. They all seem to accept that this is the way it is meant to be. They all seem to submit to God. Yet they weep. We see your plans carried out, Father, and they are beyond us. We see pain in the act of living. We often see more pain in the act of dying. We experience loss. We experience grief. A chasm opens up between us and the departed. We trust you and we question you. We coil up and we find nowhere to rest. However, we learn to submit because you are God. We wait in silence because you have laid it upon us. You may act. You may not. You are God. What do Mary and Martha want? What do you think Lazarus wanted? How do you feel about Jesus choosing to allow someone to die? When have you found it difficult to see the good in the circumstances around you? How do you walk forward through life when you are in grief or loss? 3. It’s not for me to choose, it is in Gods hands. 4. Many times but I keep looking for the Joy in the storm. 5. With God, when the storm comes I’m closer. When my father died a few years ago this was the first great loss to me. I miss calling him almost every day, I still reach for the phone to call. I was mostly upset because he had not been saved. As much as my son and I tried he would not receive Jesus as his Savior. Jesus delayed so that he could preform a miracle so that those around might believe in God who sent him. Mary and Martha wanted Jesus to come and heal their brother before he died. I have never thought about what Lazarus wanted, but I would guess he wanted to be healed. I was 8 years old when one of my friends Cody, a 7 year old, died in a four wheeling accident. I can still remember sitting at his funeral looking at him in the casket. The casket was so small. It just didn’t seem right that God would allow this to happen. Since Cody’s death, many have heard about the Lord as a result. His testimony continues to be spread today. Through this event I have come to see how God can bring good out of a situation. He even uses death to glorify the Father. Wow. I often think back to Cody and his life when I am facing grief. It is an encouragement to know that God is going to use the situation. I might not see it now, but I trust that he will. 1) Jesus delays because He is obeying His Father’s will. Also, this gave people the opportunity to witness a miracle and believe in Jesus. 2) Mary and Martha wanted their brother to come back to life, which I believe Lazarus wanted as well. 3) Honestly, at times it seems unfair and confusing as to why Jesus would choose to allow someone to die. Even though I know that God is in control, death is hard. 4) There have been many circumstances in my life and in the lives around me when it is difficult to see how God is working. 5) Though I have not personally experienced the death of someone close to me, when it happens, I believe that a time of grief and lament is appropriate. I hope to also remember that no matter what, God is faithful. Jesus delays so that God’s full glory may be revealed. He calls us to trust in His perfect timing in the midst of difficult circumstances, grief, and loss. 1. Jesus doesn’t go to Lazarus right away so that He will be able to prove that He has the power over death, and that the disciples may believe. 2. Mary and Martha probably wanted Jesus to come and heal Lazarus, and I’m sure he would have wanted that as well! 3. I know that Jesus knew that He would raise Lazarus, and that through this miracle many would believe, but from a human standpoint it still seems selfish. Knowing that God deserves all the glory from everything, though, and that everything exists to bring Him glory, puts things in perspective – if God sees fit to let someone die in order to bring glory to His name, who are we to argue? 4. There have been many times when I’ve been disappointed and wondered what God was doing! 5. When God’s will is not mine, my instinct is to complain and get angry and demand my way, but God is teaching me to quietly trust in His perfect plan. 1. Jesus delays so that people may see God’s glory. 2. Mary and Martha wanted Jesus to come while Lazarus was sick and heal him before he died, and I can only imagine that Lazarus wanted the same thing. 3. Everyone who lives dies, and I know that death is not the worst tragedy that can happen to a person; for the believer, it is actually a triumph. But none of that can take away the ache of a relationship broken with such finality, the way that only death can break it. 4. Way too often I fail to trust God that he is bringing good out of the pain I see. The hardest situations for me are probably when I see people I love persistently reject God and make a mess of their lives, when I know that God is capable of changing their hearts. But he chooses, like with Lazarus, to leave them sick, and I, like Mary and Martha, can’t understand why. 5. Too often I try to ignore and shut out loss, and just “push forward” in life. God has been teaching me to be more honest with those around me when I’m struggling, so that they can give me Christ when I’m not able to do so myself. What do Mary and Martha want? What do you think Lazarus wanted? they all wanted him to be healed. How do you feel about Jesus choosing to allow someone to die? It’s a weird thought but, it happens i’m sure He allowed it and still does. 1. Jesus delays so that God may be glorified in the resurrection of Lazarus and many may believe. 2. Mary and Martha wanted their brother back. In this passage they express faith and doubt. They struggled but I think they understood they must submit to the will of God. His ways are perfect. I believe Lazarus wanted his sisters to be strong in the faith. In regards to his death, I don’t think he feared it nor did he fight the resurrection because he was a friend of Jesus. 3. We are all going to die, it’s just a question of when. Relative to eternity, even a long Earthly life is but a vapor in the wind. I am troubled by the death of the young and innocent but I am not God. The fascinating thing is that he allows me to be a tool in preventing at least some of this evil. 4. About a year ago, I injured my right middle finger skateboarding. I had surgery but it was such a bad break that I now only have about 20% movement and the scar tissue build up has made it swollen and deformed. As a guitar player, this has been hard. Fortunately it was not my other hand though. I’m not sure why God allowed this to happen yet, but someday I will understand. If anything, the trials have brought me closer to him. 5. In dealing with grief and loss we must walk by faith and maintain a clear image of God, not turning him into a tyrant. We must also do everything in love. Doing anything outside of love is to imagine you are smart or productive, which is meaningless. He is God. I am wondering about some of these exact questions, and I don’t have any answer besides the one in the devotional. God is God, and we are not. I guess I don’t understand most why’s but I seek help for dealing with the situations. It is so interesting that Jesus weeps. Two words, and they hold so much meaning and wonder. It is comforting to know that it is not wrong to grieve. John amazes me at the wonder he manages to put into his gospel. I enjoy reading his commentary on and narration of the events. There have been a lot of trying times for my family in the resent years. People have lost faith and there are a lot of frustrations with one another boiling under the surface. When family has been something that was always a safe haven for me, it’s hard to trust God that he is going to work something good out for the family. I can relate to a deep feeling of loss when it comes to people whom you are close to. This is a time that I have to continuously ask God for the emotional, spiritual and quite often physical strength to make it through. 1. Jesus delayed to present a miracle and increase their trust in him. 2. Mary and Martha want their brother to come back to life. 3. For Christians, I know that when they die, their life has only begun. I do not understand why he allows non-Christians to die and why he allows us on Earth to experience so much pain. 4. I have found it hard when God gives and takes away. I have found it difficult when God gives me desires that are not met in the way I want them to be met. 5. I think the only way to grieve is to allow yourself to grieve and to remain in Christ—the one who knows our grief and pain. 1. to show His glory and power in what he is about to do. 2. they want Jesus to hurry up and come heal their brother and make him well. 3. I hate it. I begged and begged God to allow several people to live in my life. I don’t know why He chooses to act the way he does at times, but I trust Him. I must trust Him. What else is there? 4. Through pain and tears as a result of sin it is hard for me to see God’s good hand. 5. I rely on His faithfulness. He has always, always been faithful to me. Part 1 of 2: I will leave out my Observations, because they are too long. Here are the interpretations below, and the applications I will post on tomorrow’s. 1. It says that Jesus loved them, so he waited 2 days, and then he went. How is this an act of love? How does Lazarus’ sickness and/or death result in Jesus glorification? 2. What do the “day”, “night”, and “light of this world” symbolize in vs. 9-10? What does Jesus mean? 3. 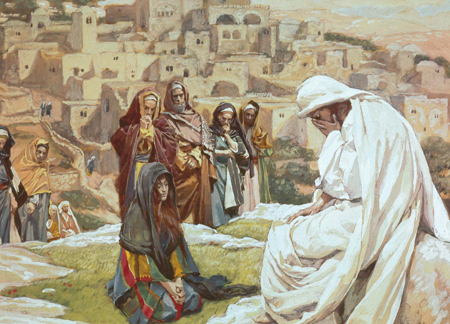 Why was Jesus deeply moved, greatly troubled, and why did he weep? 4. What can we learn about God/Jesus (his character, how he relates/responds to his people) and what can we learn about his people (their character and how they relate/respond to God) through this narrative? This sequence of events results in Martha and several other Jews coming to faith in Christ. In addition, Jesus prophesies that the death and resurrection of Lazarus will result in himself being glorified. This is because it is the event that leads to his own death and resurrection, as we see at the end of the chapter where the Sanhedrin now begins planning to kill Jesus (vs. 53). When the disciples try to dissuade Jesus from going back to Judea to evade persecution, Jesus responds, “Are there not twelve hours in the day? If anyone walks in the day, he does not stumble, because he sees the light of this world. But if anyone walks in the night, he stumbles, because the light is not in him.” It appears that what he is saying is that he is doing the will of the Father. The NIV Study Bible equates the light (at least in this passage) as a symbol of spiritual truth. It sounds like walking in the day refers to walking in the will of the Father, or walking in step with the Spirit of God, and walking in the night refers to walking in step with the spirit of the age. So, what Jesus means here by “he does not stumble” is that in walking in step with the Spirit, God’s will is carried out and He receives glory, which in turn we do as well in eternal value. Following Christ will inevitably result in (at least some) persecution, and for some, as in the case of Jesus and the disciples and many around the world today—death (which is what the disciples anticipated), but God will equip and empower his children to carry out whatever he has called them to do. Mary and the Jews both weep for Lazarus, and Jesus was “deeply moved in his spirit” and “greatly troubled” and then he also weeps. At first glance it appears that Jesus is weeping either for Lazarus or for the people, or both. But, Jesus has already stated this sickness would not end in the death of Lazarus. I do think Jesus has empathy for them, but I do not think that is what any of these three phrases mean. This is 1 of 2 times we see Jesus “weep”, the other in Lk. 19:41 over the unbelief and future destruction of Jerusalem. I think he is weeping over the unbelief and future condemnation of the people here as well. Also at first glance, “deeply moved in his spirit” appear to mean he was moved emotionally, however I think it means the Spirit was leading him to do these things. Jesus was also “deeply moved” a second time which he then proceeds to the tomb of Lazarus. Gal. 5:16-17 says, “But I say, walk by the Spirit, and you will not gratify the desires of the flesh. For the desires of the flesh are against the Spirit, and the desires of the Spirit are against the flesh, for these are opposed to each other, to keep you from doing the things you want to do.” I believe Jesus was “deeply moved in his spirit” and “greatly troubled” because he was following in the will of the Father by the power of the Holy Spirit, and he knew this specific event would lead to his own death, but that it would result in resurrection and life for both him and those who believe. 1. Because he had a plan and purpose behind everything he was doing. He had a much greater plan for Lazarus more-so than what any of them could imagine. 3. I think that is such a touchy subject because although God is fully capable of doing so…today when someone dies they die and they are not raised back from the dead. When someone dies that is the last time you will see them on earth if they are a christian and you are as well…but if someone is not a christian and they die…you know that you will never see them again and that that is it. When someone dies God has a reason for it and purpose behind everything. Death is a natural part of life it is tragic and horrible but it is life and only God knows when this will happen to someone. 4. One day my house flooded and collapsed and my family lost everything…and I didn’t understand why on earth God had let this happen… later I then found out he used it as an opportunity to see how much God provides and how you need to trust in him when things get hard. Sometimes when you lose someone you love you only think of how they are gone and you wish they were back and you would do anything to have them back again…that is when it is hard sometimes…But God always reveals himself and his purpose whether in this life or the next. 5. When I experienced grief I had to be alone for a little while and just trust in God to provide and that he had a plan and even though nothing made sense to me why they were taken..he had a reason for it. 3) The only reason I feel comfortable with Jesus allowing someone to die is because I did not know Lazerous, obviously. If I were Mary or Martha and it were my brother I think that I would have been angry and I would have seen it as an insult to my brother that Jesus didn’t save him. 4) Times where I find it the hardest to see good around me are usually when the people I love the most are hurting so desperately and I feel as though it is unfair. This summer I was away in Europe while everyone in my family was suffering through so much without me around. It was hard not to get angry at God because I felt as though he was being unjust. 5)When I am grieving (which hasnt been often) I cling to Psalm 61:1 and realize that I have no strength but God will carry me through. 1. Why does Jesus delay? Not sure why, but it seems to be all so that God would be glorified in him raising Lazarus from the dead. 2. What do Mary and Martha want? What do you think Lazarus wanted? They wish Jesus had come before Lazarus died (and I sm sure Lazarus wished the same), but they also trust that Jesus can do all things. 3. How do you feel about Jesus choosing to allow someone to die? If it is to show God’s glory, then praise Him! Parts of me rebel against that, but another large part of me welcomes the work of God. 4. When have you found it difficult to see the good in the circumstances around you? I have been feeling it now as my husband and I have been living out in the neighborhoods of Chicago for a few months. I feel surrounded by brokenness and concrete. Yet I have to remind myself that God is in charge and there is still good in the world. 5. How do you walk forward through life when you are in grief or loss? You have to rest in the will of God, knowing his plan is sovereign. The beginning verses of this chapter seem to indicate that Jesus delayed in order that God might be glorified. Although, as I answer these questions I am well aware that my familiarity with the story may be skewing what is actually in the text. Although it is only hinted at in their original missive, I believe that Mary and Martha both greatly desired for Jesus to come and heal Lazarus. I believe that Lazarus also wanted to be healed. I think my feelings on Jesus allowing someone to die are somewhat divided. In the story of Lazarus, it’s a little easier to conceptualize of Jesus allowing him to die, because reading the following verses seems to indicate that it was Jesus’ intent all along to raise Lazarus from the dead. Of course, Jesus’ power in modern times is not less, but it is also fairly improbable that someone who dies will be raised again on this earth, and that makes their death a bit harder to swallow. I cognitively know that God is sovereign, and that allowing someone to die is perfectly within His role as sovereign ruler, but applying that cognition to the heart is a little more challenging. One situation in which I find it quite hard to trust God to have good in mind is also, ironically, a situation in which I have no choice but to trust. Many foster children have come through my home n the past two years, and each one is unique and uniquely hurting, and of course, I fall for each of them in a different way. The little girl who lived with us last winter was 3.5 years old and a whopping 25 pounds. She was tiny and precious and vulnerable and I spent most of my Christmas break with her and my other sisters. She left our house to live with a relative in the middle of January under rather uncertain circumstances that none of us felt good about. Something about her and her situation weighs on my heart more than the other kids, and I have spent the last ten months alternately aching for her (we have no contact with her/her relatives) and praying desperately for God to protect her. I have not yet had to face the loss of a close loved one, but I believe that, in dealing with loss, there is a certain balance one strives for, between acknowledging the pain and allowing oneself to feel the weight of that, and also taking steps forward in life, slowly but surely moving beyond the chaos and the ashes. He delayed so that as a result he could perform a miracle that would cause the witnesses to believe. They both wanted Lazarus to live, and I think Lazarus wanted to live as well. It is hard for me to understand why Jesus would choose to let someone die. In this case, it did not matter because he brought him back to life, but could that death not have been avoided? I have lived through multiple people in my church and extended family die, and although I know that they were saved, it is still hard for me to see them go and to see the good in that. You just have to find solace in the fact that they were saved and are with God. I have been thinking of this passage lately in a very raw sense, as I am walking beside my sister in the loss of her closest friend in life. I am compelled by the humanity of Jesus in this passage, and wish for my sister to embrace the reality and necessity of grief. We think of life as our own but realize then that our lives are in the hands of an Almighty God whose ways transcend our understanding of goodness.